Is there anything more exciting for a scuba diver than to explore a sunken shipwreck? We don't think so! This fun dive in Bali takes you out into the tropical waters of Tulamben, where you'll do two dives on one perfect day. You'll set off first to explore the shipwreck of the USS Liberty on a long dive of 45-50 minutes. After that, you'll return to the boat for a light lunch, before you head to your second dive, which usually takes place at the gorgeous Coral Garden site. All dive groups are kept to 3 divers per instructor to give you a more personal experience. NOTE: You need to be at least a certified PADI Open Water Diver to dive to the shipwreck on this scuba diving trip in Bali. Tulamben is famous for having dive sites for all kinds of divers, but the shipwreck of the USAT Liberty is one of the best loved sites, and is considered one of the easiest wreck dives to do. This war ship was torpedoed by a Japanese submarine in World War II, and lies on a sand slope between 16-91 feet deep, which is why you need at least an Open Water Diver certification to dive here. The wreck attracts blue spotted stingrays, porcupine fish, octopuses and reef sharks, and offers stunning visibility up to 20 metres. Coral Garden is a long stretch of reef that attracts a wide variety of marine life, including eels, octopuses, cuttlefish, shrimp, and black tip reef sharks. At its shallowest, it lies at 9 feet deep, but goes down deeper to more than 50 feet. • Discover a half-century old, coral-encrusted shipwreck under the blue waters of Tulamben. • Dive to Coral Garden to spot a number of fascinating fish and sea creatures. 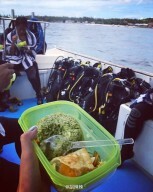 • Do two fun dives in Bali. • Add new and interesting dives to your log-book. • Spend a day out in the tropical paradise of Tulamben. You must respect the natural habitat during the fun diving trip in Bali. If cancellation is made 7 days or more before the departure of the fun diving in Bali: Full refund, minus any transaction charges. If cancellation is made between 0-7 days before the departure of the fun diving in Bali: No refund. The operator reserves the right to cancel, alter or reschedule the itinerary of the scuba diving in Bali due to unforseen circumstances such as earthquake, tsunami, flood, storm, hurricane or any other natural disaster, war, political unrest and other hostilities that declare it unsafe, harmful or impracticable for the participants or staff. Participants are responsible for their own belongings and the operator will not be responsible for any loss or damage during the fun dives in Bali. The operator provides free hotel transfers from Sanur. Participants will have to sign an indemnity form before the fun dive in Bali. Eat a good breakfast before your pick up arrives at 07:00 hrs. Reach the dive centre by 07:40 hrs and after completing some paper work and a short briefing session, you'll board a boat to Tulamben. It is a scenic 1.5 hrs journey. In Tulamben, you'll dive at the USAT Liberty shipwreck first. When you're done, you'll head to Coral Garden for your next dive. In between, you'll be served lunch, snacks, and drinking water. When the day's diving is done, you'll head back to the dive centre. You'll get your log book updated, and then will be dropped off at your hotel in Sanur. Trip ends here. Your operator will arrange your transport to the start point of the fun diving in Bali.